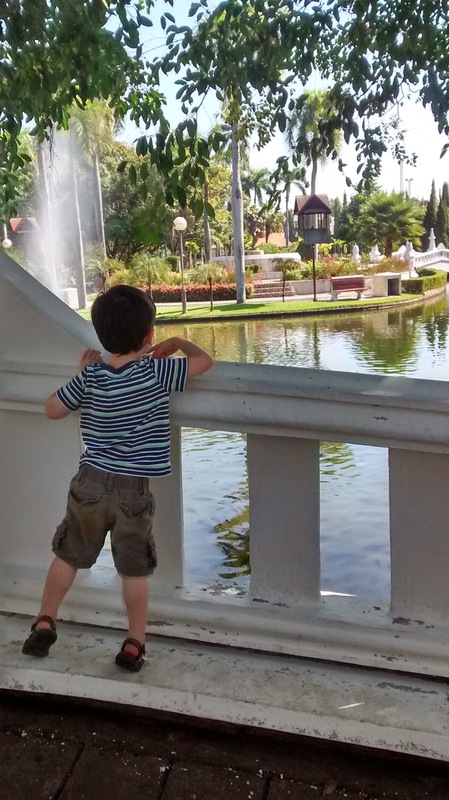 It’s hard to believe that our time in Chiang Mai is coming to an end! 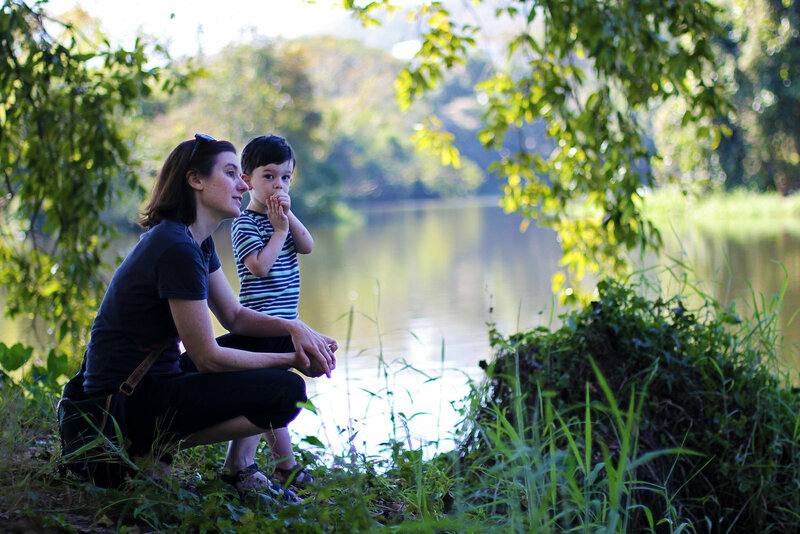 We’re spending our last few days here soaking up all we can of the city and revisiting some of our favorite places. 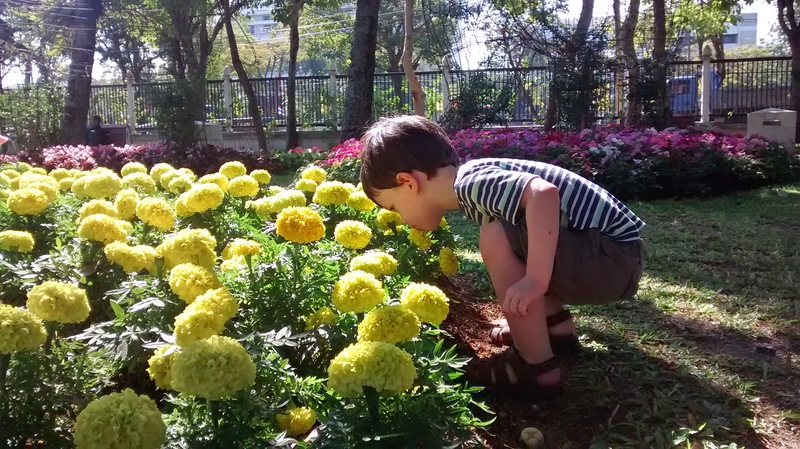 Our last chance to smell the yellow flowers. Our last chance to feed the fish. It’s amazing how many fish can live in a murky brown pond when given continuous food. Our last Sunday market street food. 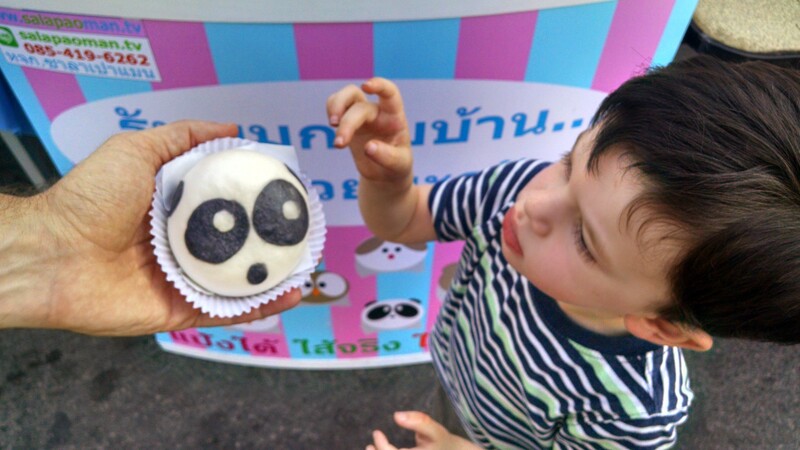 There really aren’t enough foods shaped like pandas. Our last giant tropical smoothie. 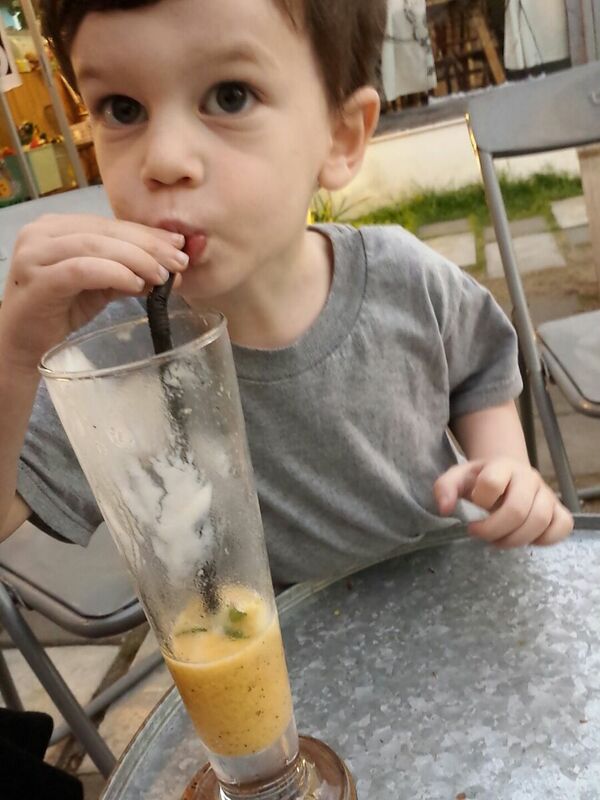 Just kidding, there’s always time to drink your height in smoothie. You wouldn’t think his stomach was that big. 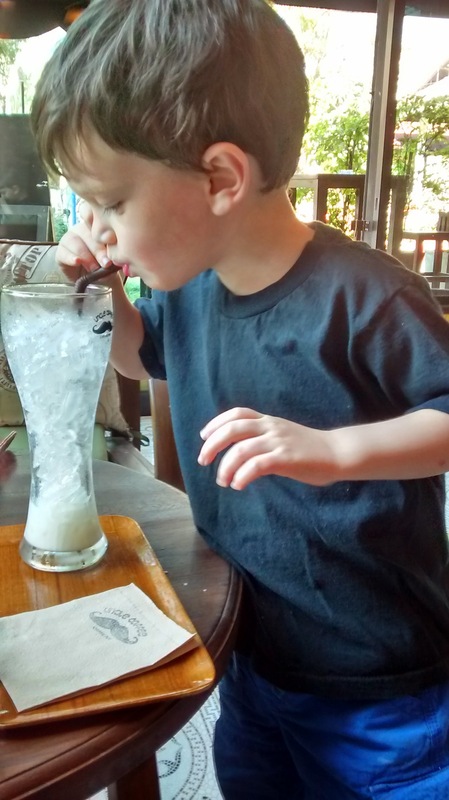 And of course he immediately asked for another. And our last songthaew ride. It’s a picture of a songthaew taken from inside a songthaew! I’m sure we have a few more lasts up our sleeves before we leave, but I’ll be sorry to say good bye to Chiang Mai! 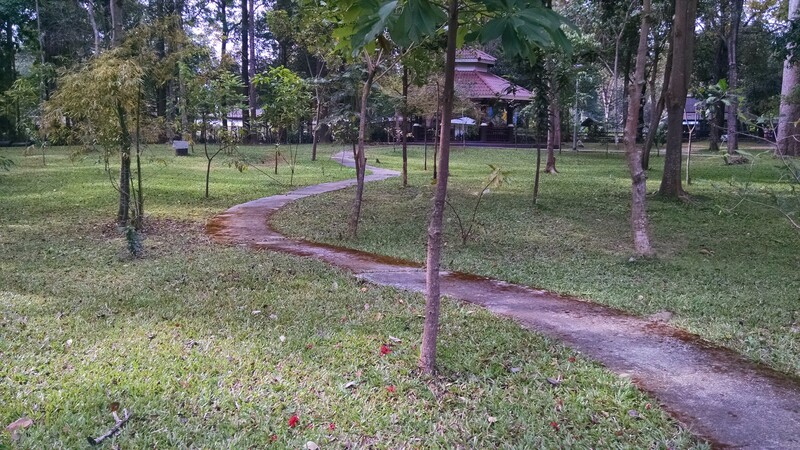 Tucked into a corner of the Chiang Mai University campus beside the Convention Center is the Princess Mothers Health Garden. 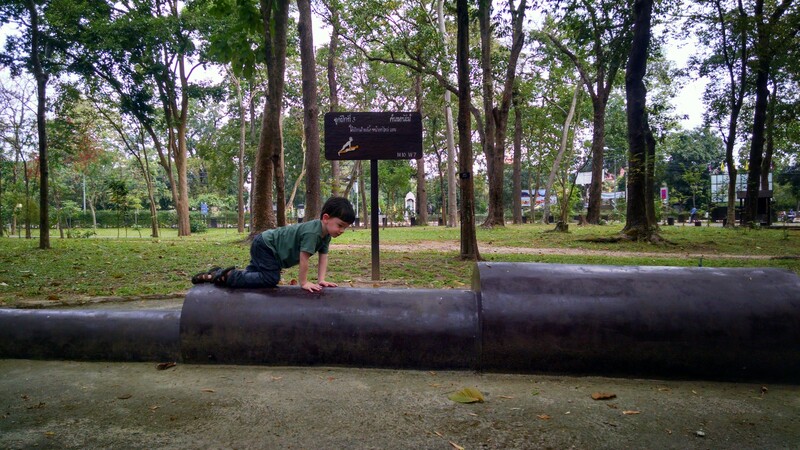 I talked about visiting this park in a previous post, but was mostly talking about all the circuit training stations places all around the park. What I didn’t mention is that there’s a great paved running path around the park. It’s marked as 300 meters around, and is fully shaded. It meanders a bit, so it’s a little more interesting than just running on a track, and is not at all crowded. I think I only saw two other people there on the day I went. If the 300 meter loop is too short for your liking, you can also run around the Convention Center area, which is connected to the park, or use this loop as part of a running tour of campus. This park can be a little bit difficult to find. 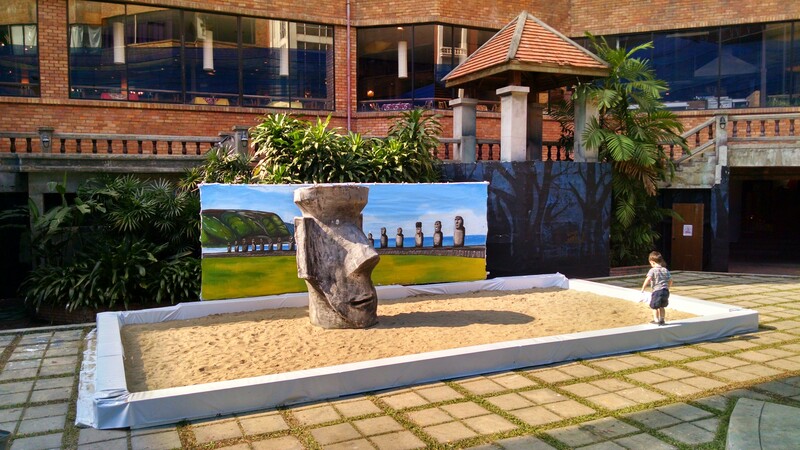 It is just north of the Convention Center, and if you are on Nimmanahaeminda Road in front of the Convention Center, you will be able to see it to your left as you are looking at the Convention Center. The gate into the park is on Sai 26 Road. Just turn right on Sai 26 and you will see the park entrance. 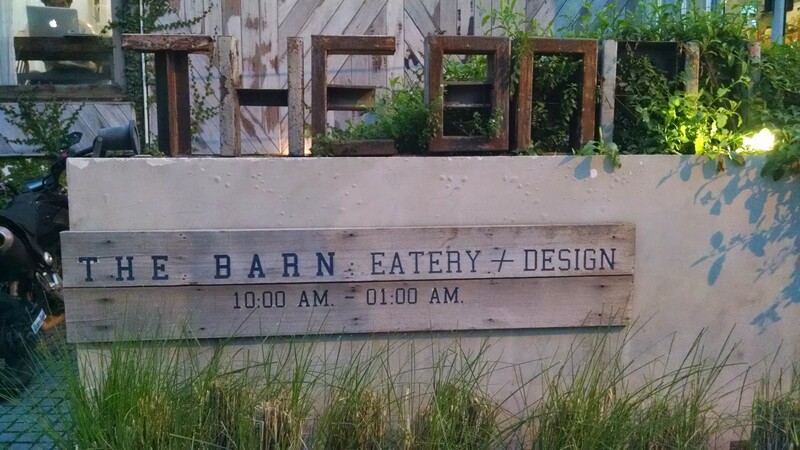 Our neighborhood has a cool new café called The Barn. This café was designed by some local architecture students as their final graduation project. 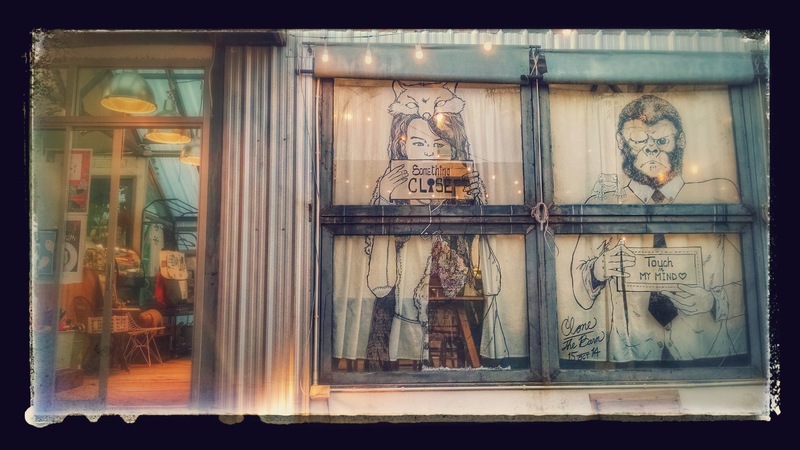 It has everything you may want from a hip, trendy café: unfinished wood floors, antique rocking horses, tables made of spools, naked globe lights, cooler-than-you art on the windows. They were even playing Arcade Fire on the sound system (but not the new Arcade Fire, if you know what I mean). And that sound system? Disguised inside an antique radio. There was the usual array of espresso drinks and sweets available. 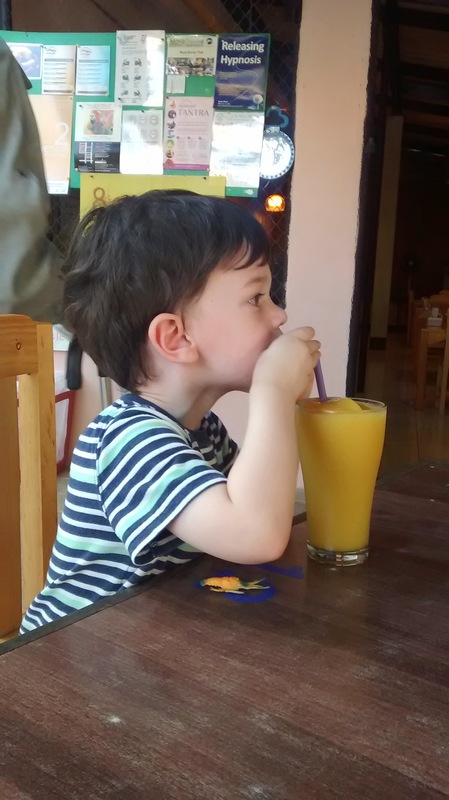 Hugo enjoyed the smoothies. It’s a great place to come and sit and work alone on your Apple brand electronic device. Here’s where to find The Barn if you are ever wandering around Chiang Mai in search of espresso and lo-fi music. My friend Rosanna asked if I could post some pictures of funny English mistranslations. Honestly, Thailand hasn’t been a great source of ridiculously bad English. A lot of people here speak very good to passable English. Even the old lady at the fruit stand can quote me a price in English. This is good because I’ve only managed to learn to count to three, so unless my bananas cost three baht or less, I’m in trouble. 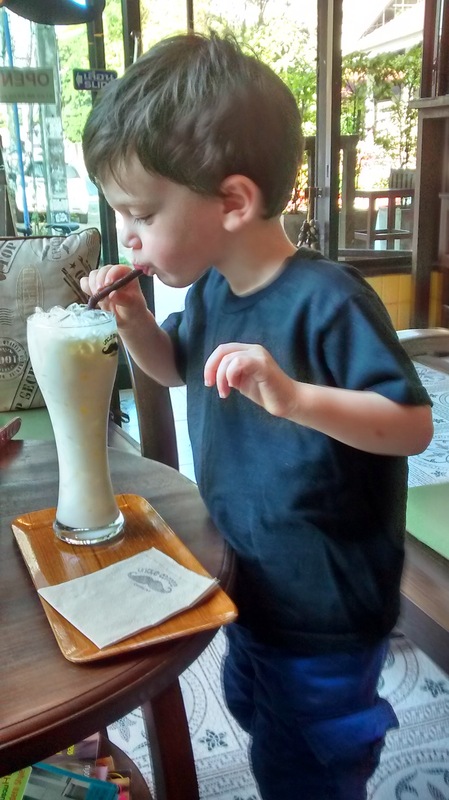 So here are some of my favorites from Thailand (so far)! Always remember, freedom isn’t free! 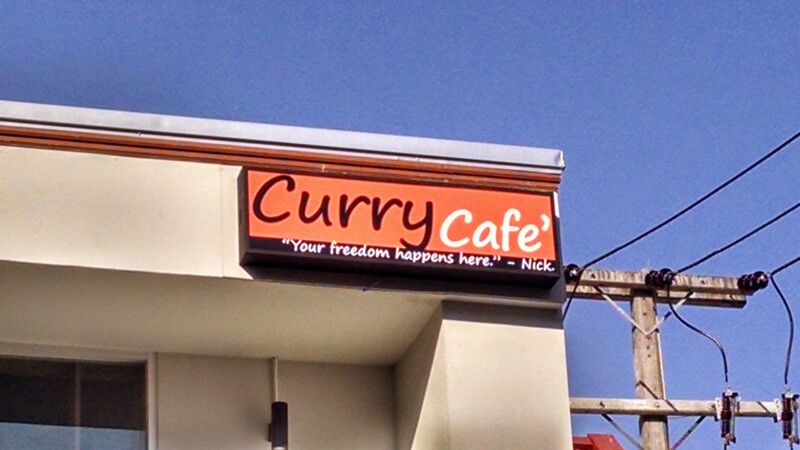 It’s available for the price of a tasty curry. 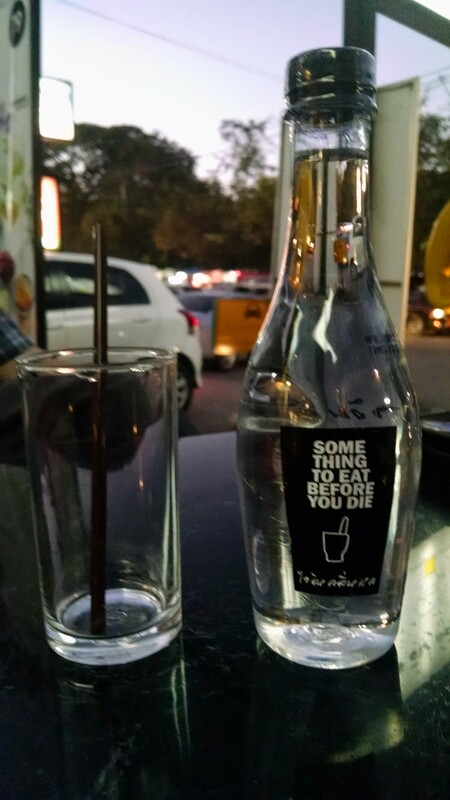 I didn’t die after eating here, but I sure felt like I was going to! I could list all the ways this ad is sexist, but it would make me cry. 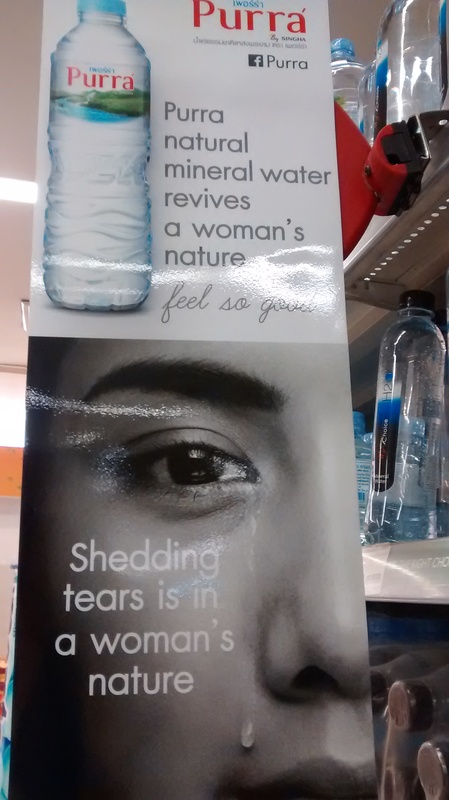 Purra Marketing Exec: We need to sell more water to women. Our studies have shown that women are the primary water buying decision makers. Purra Ad Agency Exec: We should try to appeal to their emotional side. We all know that women are emotional. It’s because of their weird lady-parts and hormones and stuff. Purra Marketing Exec: Yeah, my wife just won’t stop crying whenever she’s on her monthlies. Purra Ad Agency Exec: Wait! That’s it! Purra Marketing Exec: Co-marketing with sanitary products? Purra Ad Agency Exec: Don’t be gross. Hear me out, I’m having a Don Draper moment. Tears are made of water. Purra water is made of water. Purra Marketing Exec: This is genius. I can’t believe no one realized that before. Have the intern write some copy and find us a stock photo of some crying lady’s face. I want to go national with this by next week. I’m going to write a series of phrases, each more unbelievable than the last, but trust me, every single one is true. Today, I went to a mall. 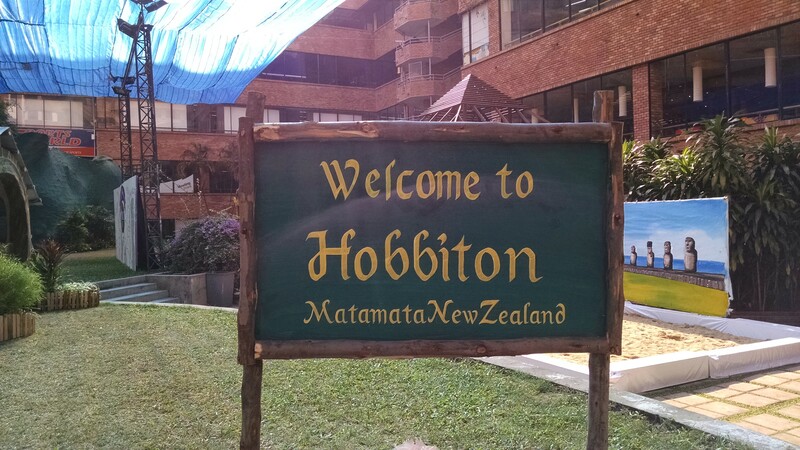 In the courtyard was a life size replica of Hobbiton. A glimpse into movie magic? Bilbo? Frodo? Are we late to the birthday party? 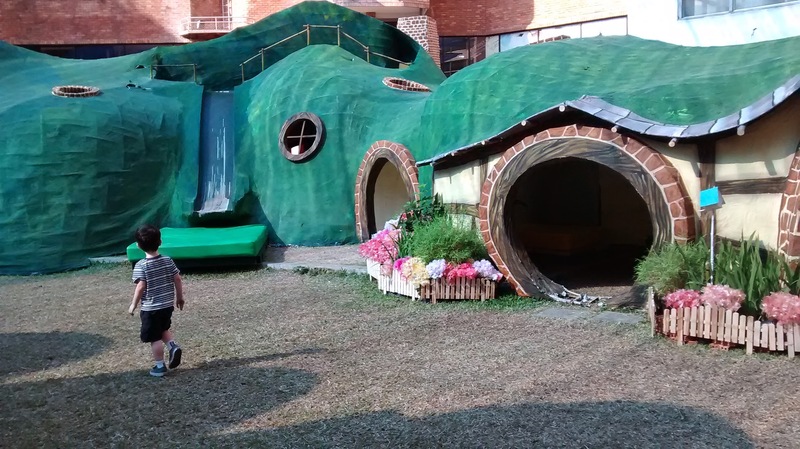 All made of paper mache on top of bamboo scaffolding. 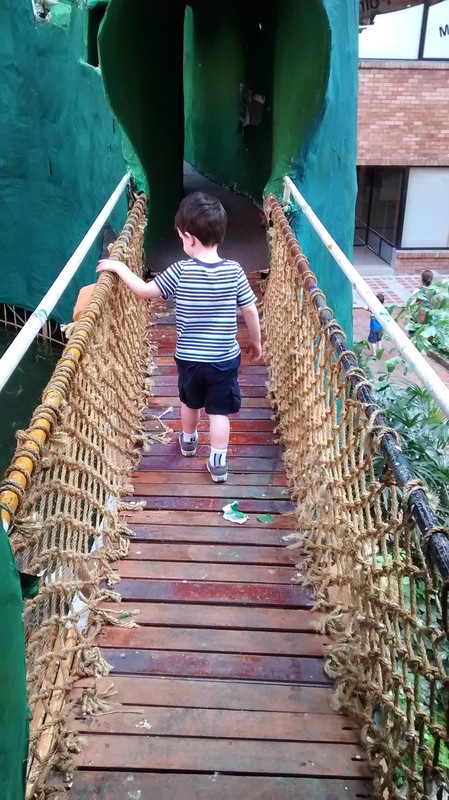 It ranged all over, a multi-level playground to explore, with tunnels, twists, turns, slides, bridges and obstacles. What’s the name of that place the Elves are from? The orcs will never find us up here! 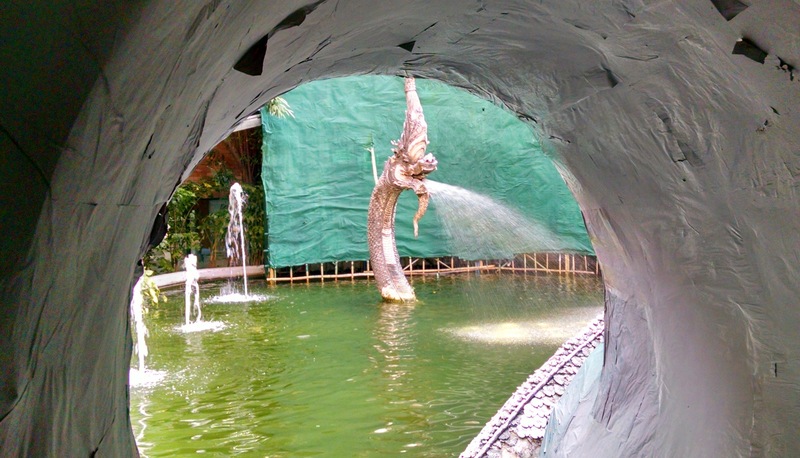 In the center was a water-spewing dragon. I’m sure if this was in the US it would require me to sign a notarized waiver in triplicate. Maybe we’ll build one in the back yard when we get home. It seems we’ve spent the better part of the last two days looking at captive animals. 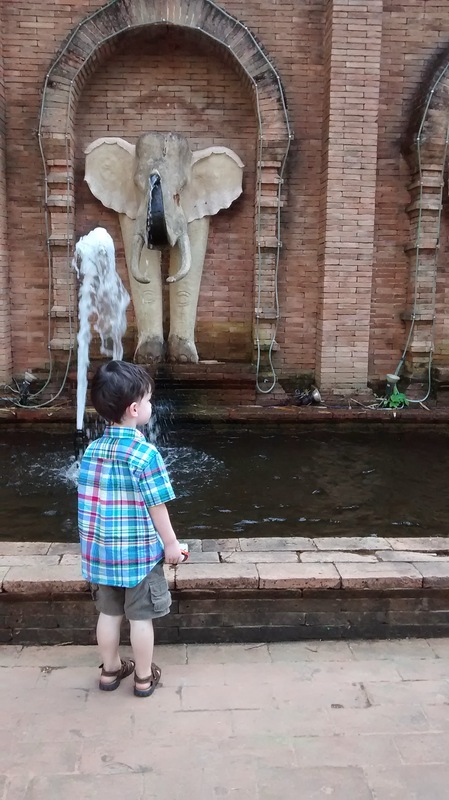 The Chiang Mai Zoo is actually quite enormous. Lots of people drive their cars or scooters around it, or rent a little electric golf cart. We elected to take the tram. You can buy tickets for the tram near the entrance gate and hop on and off wherever you like. I will add that the tram isn’t the most convenient. Sometimes you have to wait awhile for the next one to come along, or you’re heading to the tram stop just as you see one pull away and then you have to hoof it to the next area, or just wait another 20 minutes. 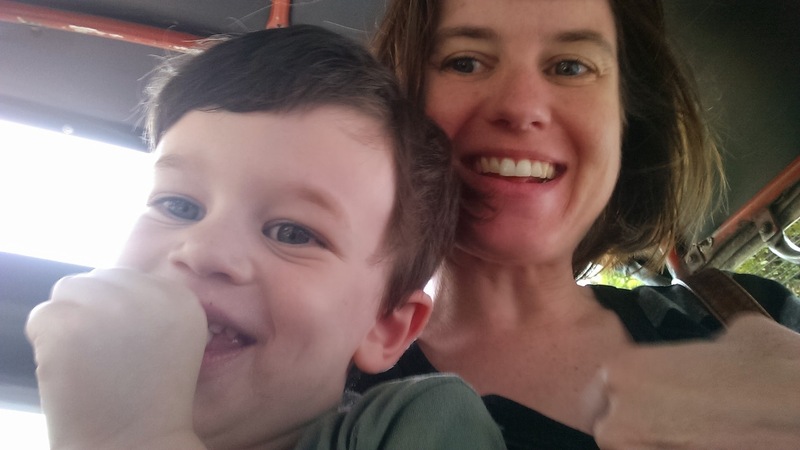 If you have little kids who just can’t make the hilly walk, I’d definitely recommend the tram or golf cart option. As I mentioned, the zoo is enormous. It’s in the foothills of the mountains, and it is very hilly. If the weather is nice, it would make a great half day hike punctuated by exotic animal viewing. I saw some people there who had strollers, but it’s not particularly stroller friendly terrain. There are a lot of stairs. 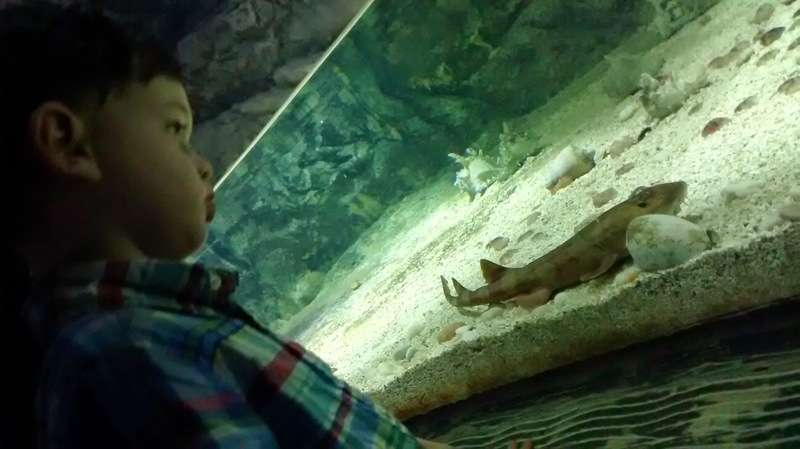 It’s a separate admission for the aquarium. 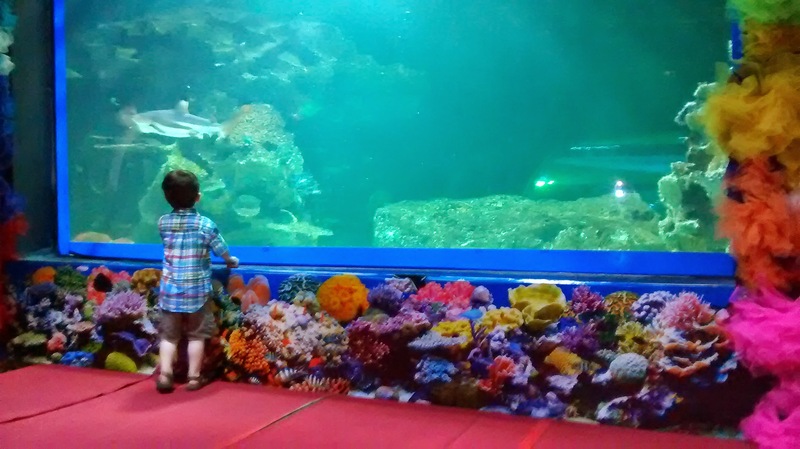 It’s a pretty big aquarium with a lot of sea creatures on display despite its somewhat rundown appearance. Black tip reef sharks! It kind of looks like this glass is being held up by blue duct tape. If you’re accustomed to the Seattle Aquarium or the Aquarium of the Pacific, you’ll find this one is nothing to write home about. 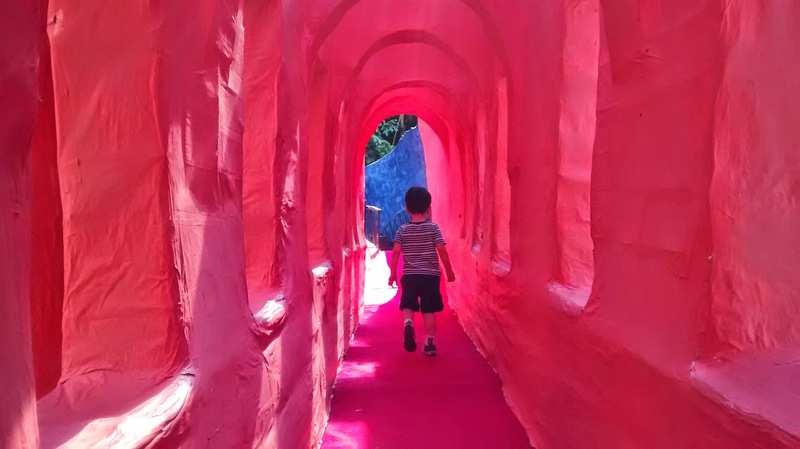 However, Hugo is a lover of all things of the sea, and was thrilled to be there, running from display to display and naming everything he could see. 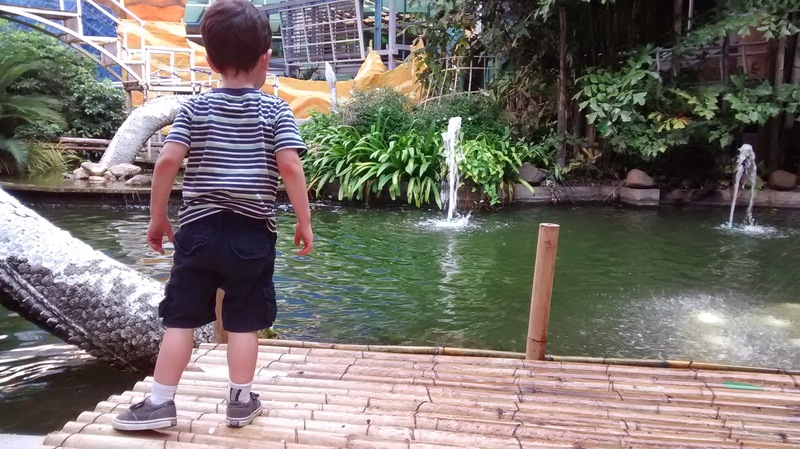 Kids under 4 are free! 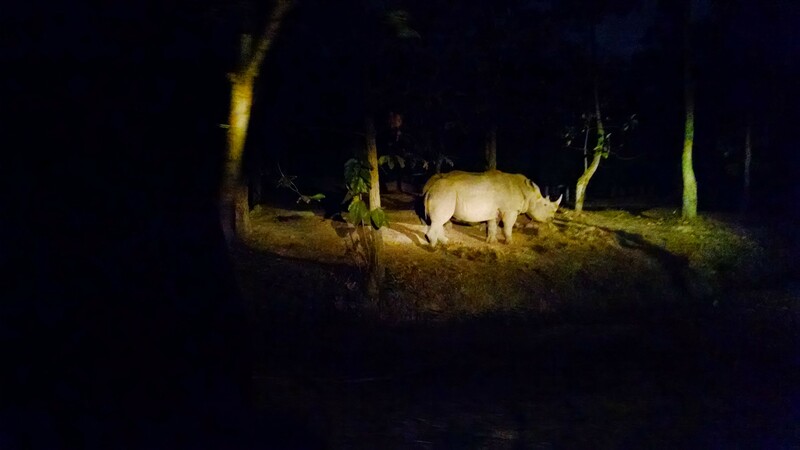 Last night we went to the Chiang Mai Night Safari, and if ever there was a place which achieved the perfect combination of spectacle, danger, and kitsch that I have come to expect from and Asian theme park, this is it. Giant light up plastic animals? Check. Eardrum shattering sound system? Check. Dangerous wildlife wandering about, uncaged and uncomfortably close? Check. Dancing women (who might actually be men? ), dressed to represent each ASEAN member nation? Check. Laser light and water show? Check. 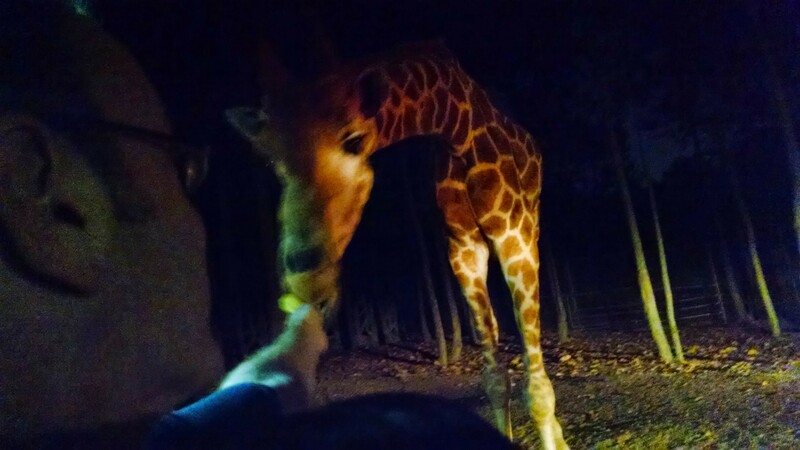 The Night Safari is a combination zoo/theme park/resort. There are things to do there during the day, but the more popular option is to go at night. It is both as amazing and as awful as you think it’s going to be. Feed a starving baby goat! The main attraction is the tram ride which takes you – in complete darkness – through two separate open habitat animal enclosures. For the more dangerous animals, there is a large trench that protects you from attack. For the less dangerous animals, you’re on your own! 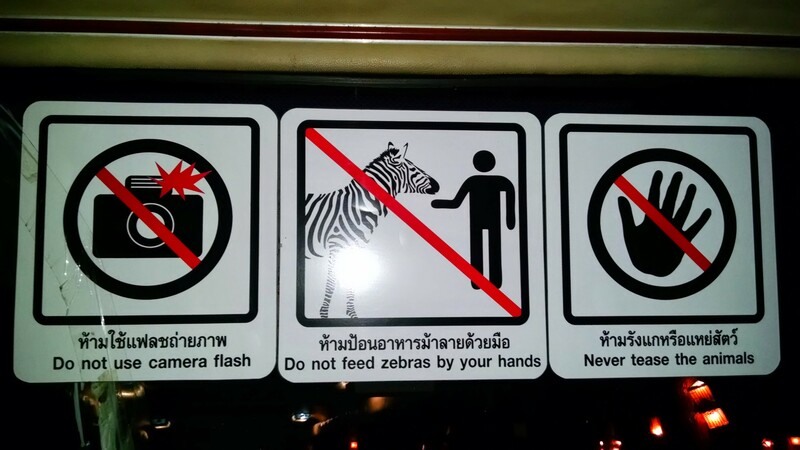 Our driver warned us repeatedly that the zebras have very sharp teeth and may bite our fingers off, but she didn’t warn us that the zebra will stick its face in your lap looking for hidden food. There were lions, tigers, bears, and hyenas all around us! I am not convinced the depth of the trench was enough to stop a truly determined Siberian tiger from reaching the tram, but I’ll give them the benefit of the doubt since we made it out in one piece. 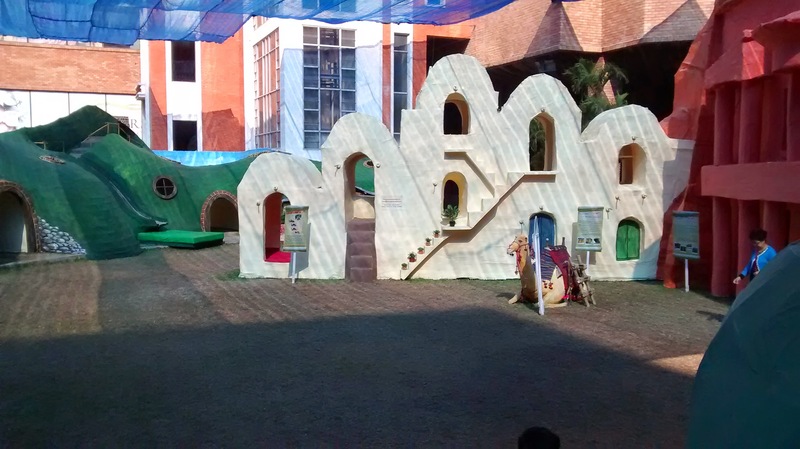 After the tram ride, you are invited to enjoy the shows put on in the courtyard. There was some kind of cowboy/roping demonstration, fire eating, a tiger show, and the aforementioned dancing ASEAN countries. The night was closed out by a laser light/water fountain spectacular. 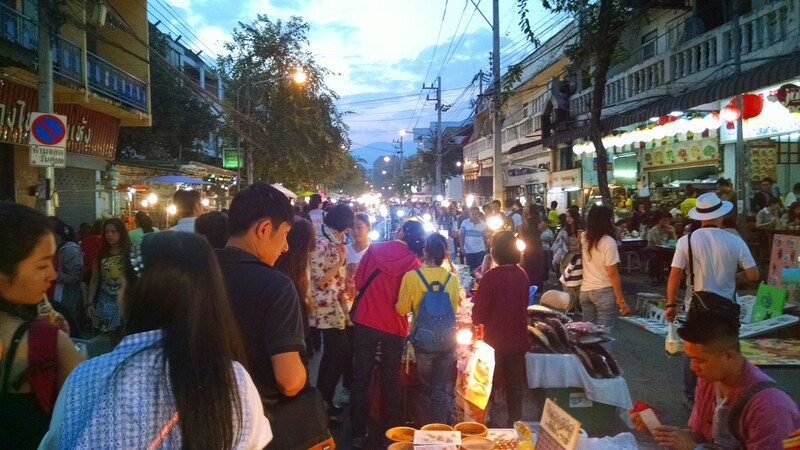 The Sunday Night Market is one of the biggest attractions in Chiang Mai. Several streets in the Old City are closed to traffic and filled with vendors selling art, handicrafts, clothes, toys, food…really anything you can think of. There were even some stages with live music and dance performances. We got there pretty early and it was already packed with people. Hugo loved weaving in and out of the crowd, and that all of the things were right at his level. We kept losing him in the crowd since it was so much easier for him to dart around people. I think he touched something on every table we walked past. I swear I turned my attention away for barely a second and he had stuck his whole hand into a spice vendor’s pot of green curry powder. 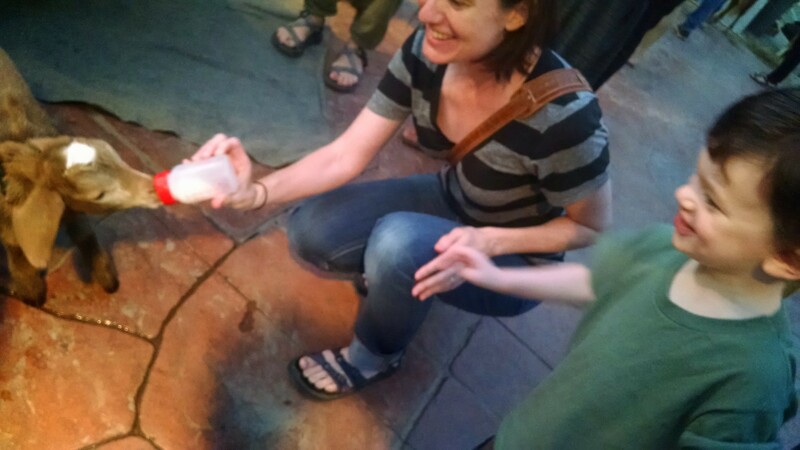 Luckily, the vendor didn’t seem to notice so I quickly wiped his green powder-covered hand off on his green shirt and directed him elsewhere before he caused any more damage. 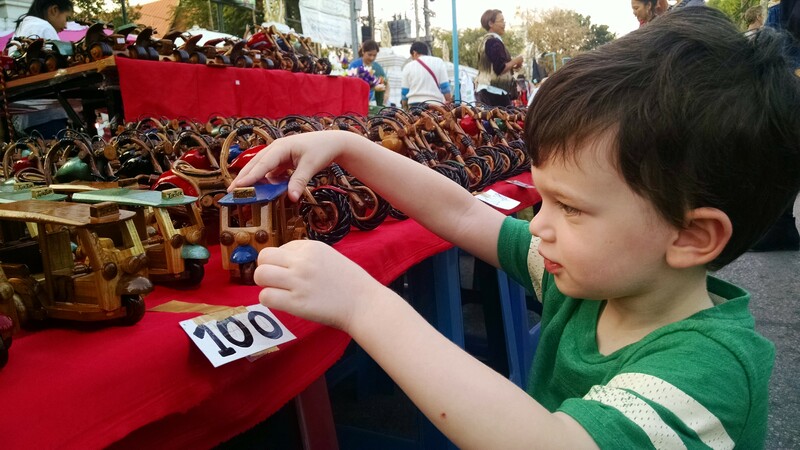 So he is now the proud new owner of a tiny wooden tuk tuk and keeps saying how much he wants to go back to the market again and buy a bigger tuk tuk. 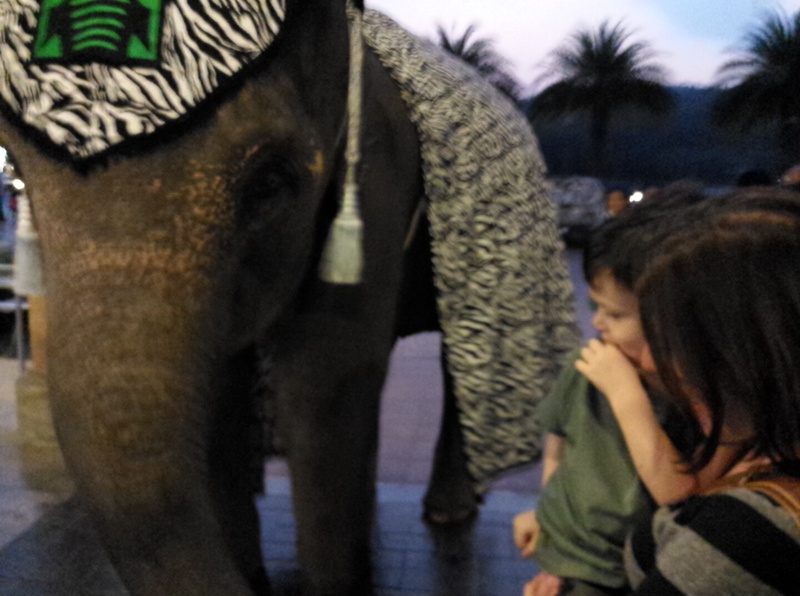 It seems like everyone who comes to Chiang Mai wants to ride elephants or feed elephants, or at least see some elephants. So, the elephants are so far away that we can’t even see them! 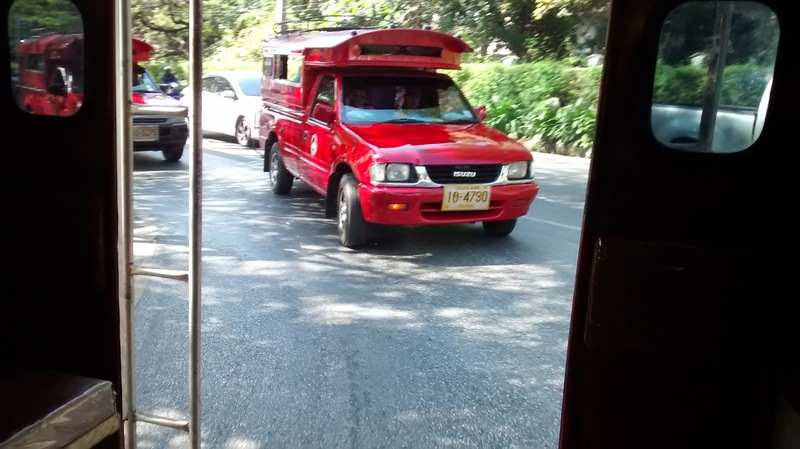 Tuk-tuks give the illusion of safety, but are really just benches strapped to the back of a three wheeler. We also built some sand castles (or “sand mountains” as Hugo calls them), and I got bit by an ant. All in all a pretty good (albeit elephant-less) day. 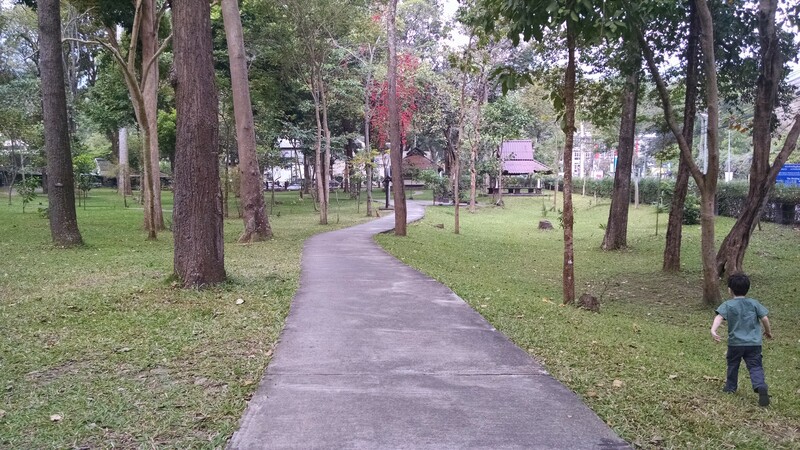 Chiang Mai University has a sprawling, wooded campus on the western side of Chiang Mai. 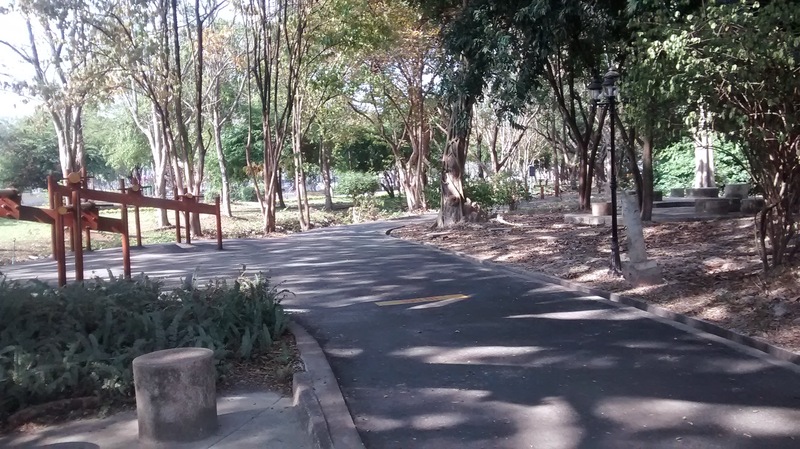 There are nice sidewalks all over campus, so it’s easy to enter at one of the main gates on Suthep Road and just wind here and there until you’re ready to head home. I’ve found that the best place to enter the campus is at one of the gates just west of Canal Road. There is a nice little lake up at the north end, near the north gate onto campus. It’s not very big, but is a good destination point for your run. 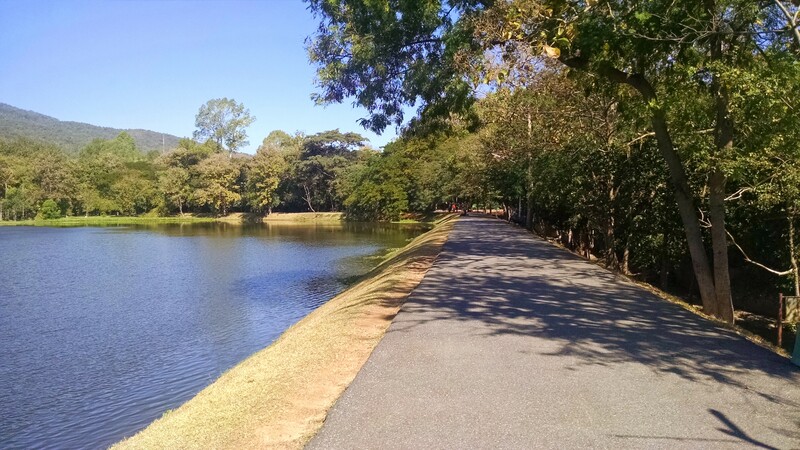 The path doesn’t go all the way around the lake, just about three quarters of the way, but if you’ve been running through the campus it’s a nice change of scenery. This park has a nice paved running path, some gazebos, and clean bathrooms. Since it’s an arboretum, the different species of trees are all labeled. The loop through the arboretum is not very long, but is fully shaded and flat. 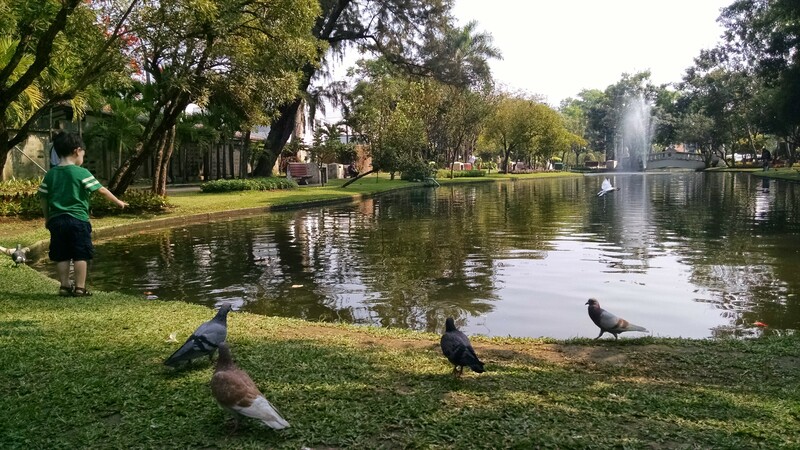 If you don’t want to run through campus and would just like to check out the arboretum or the lake, hop in a songthaew and tell the driver to take you to the zoo; then, just hit the buzzer to get out when you see the north campus gate or the sign for the entrance to the arboretum. They are very close to the entrance to the zoo.